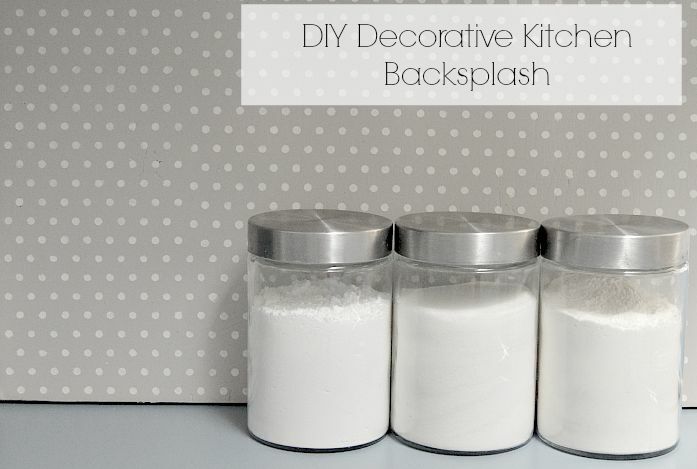 Need to add some cute decor to your kitchen but don’t want to make any permanent changes? Ripping out a whole wall can be expensive and time consuming. Not to mention it may not even be a possibility if you rent. Perfect for your counter, this project is a way to give an outdated or plain kitchen a modern feel with a touch of personality. I made this one out of a stray piece of wood that a friend of mine was giving away. I wanted to add some of my own color and personality to my kitchen. 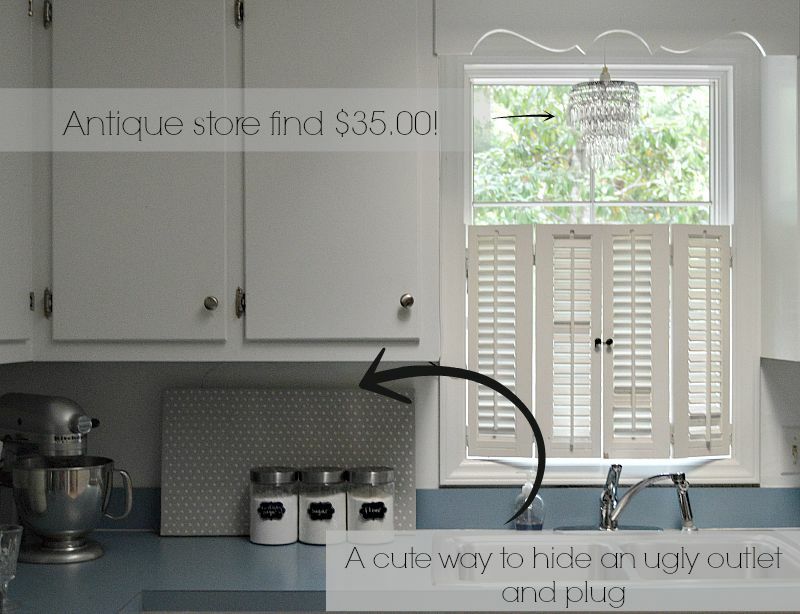 I also wanted to hide an outlet where a cord and plug form this adorable chandelier I found in a local antique shop. The cord was hanging right out in the open and looked messy. I took a piece of wood and transformed it into a cute make-shift back splash. It hides the mess and ties the look of the chandelier together nicely. I used semi-gloss indoor interior paint, that means it is wipe-able as well. 1. Sand a large piece of wood that fits into your space properly. 2. Add a coat of paint / then design with additional paint as you wish. 3. Allow to dry and place in area. This is what the wood looked like before. It was part of old white wooden shelves that used to sit in a garage. It was in good condition so it was perfect for my project. There was not a thick layer of paint to remove so I used a hand held sander, all I had was fine grain sandpaper and it worked great. It took about an hour to sand the whole piece of wood. You can start out with a coarse sand paper grit to get the paint off, then switch to a fine grit sandpaper to smooth the surface. Once smooth wipe clean of any dust or particles. 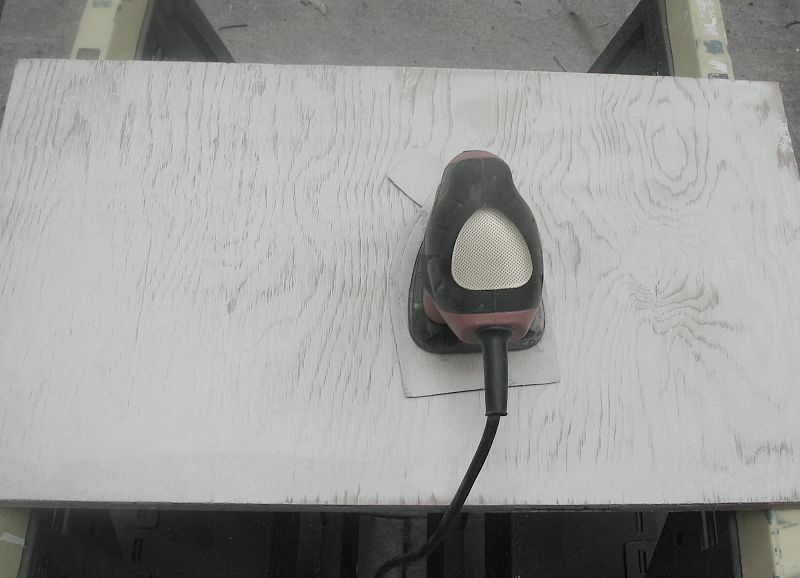 Once you have a smooth sanded piece of wood you are ready for paint. 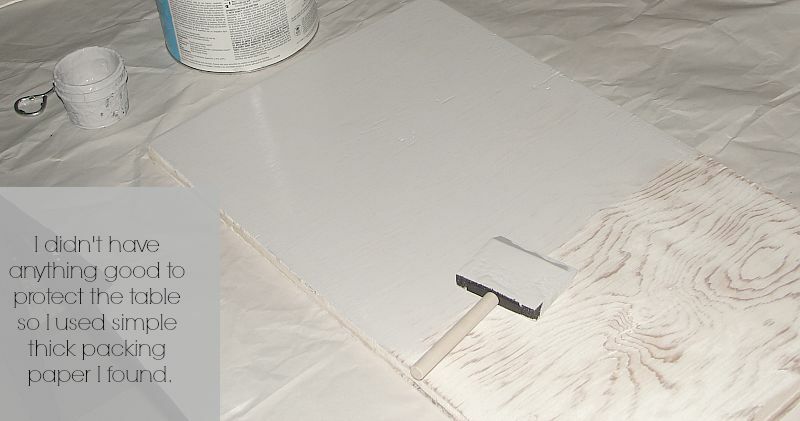 Place a drop cloth or protective cover to the surface you will paint on. I used a semi-gloss interior acrylic/latex finish paint. Once you complete a coat all sides and edges with a coat of paint repeat for at least two coats. Then allow to dry completely. I used a polka dot stencil to add a design to mine. 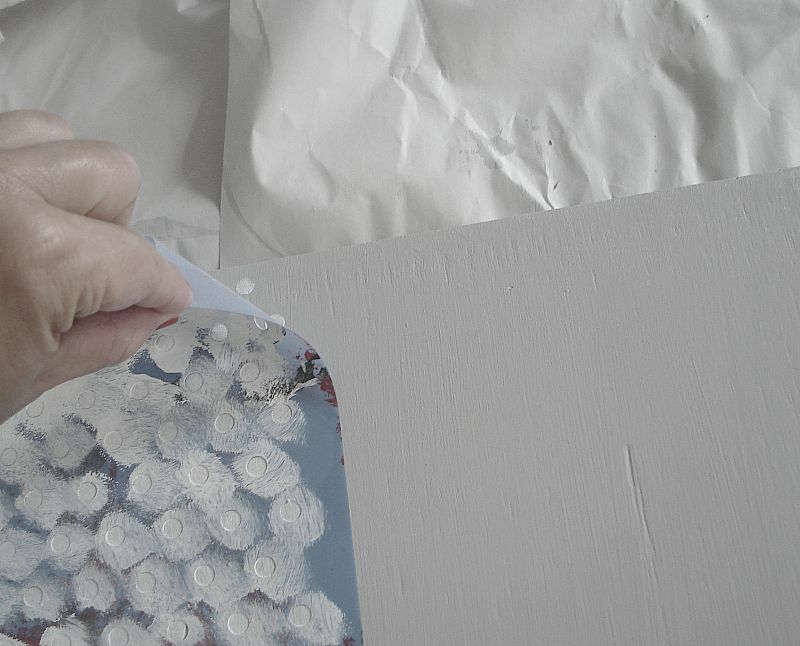 When using a stencil it is best to use a stencil adhesive. This will help the stencil stay in place and the allow the paint to stay in the lines of the stencil for a neat and clean design. 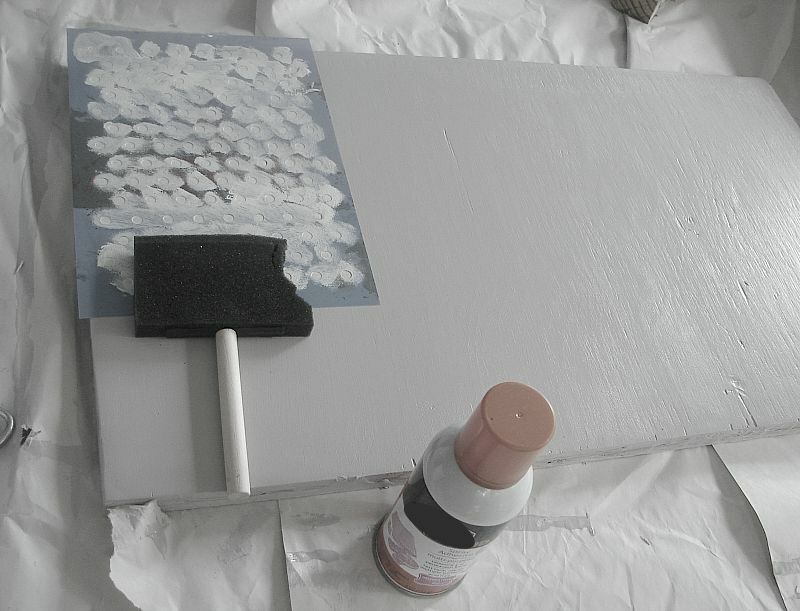 First, spray the stencil as directed on the bottle, and let dry before applying to surface. Applying paint with a foam brush works great. You may have to dab a few time and watch how much you coat, make sure you use the same technique for each area for an even design. Once you pull stencil carefully, check for errors. If you use semi-gloss interior paint like I did, any imperfections should wipe off easily. Before adding more stenciled designs, make sure the first set had dried. Then simply repeat in a neat order if you have a patterned design. Let dry for 24 hrs once it is complete. Once it is ready place in desired area.